This past weekend, J.M. 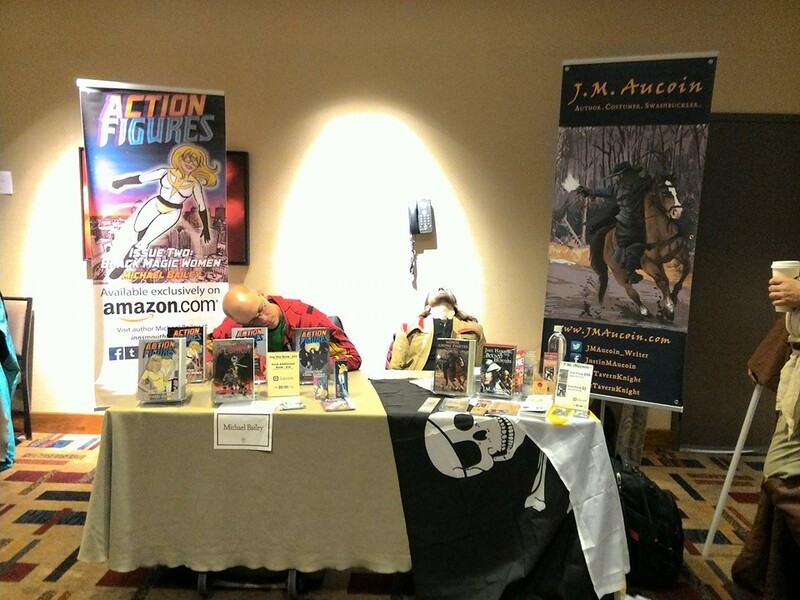 Aucoin and I shared a table in the artist/author alley section of Arisia 2016, a long-running fantasy and sci-fi convention in Boston. This was our first time pimping ourselves out at a major convention, so we had no idea what to expect, on pretty much any level beyond what sort of people would be attending — which is why we took a chance on doing the show, because we figured if nothing else, we’d be surrounded by avid readers with a taste for non-mainstream fiction. Justin and I by the third day of the show. Sleep was the enemy. Caffeine was our friend. It was a long four days, and while neither of us made enough money to allow us to run around our homes pumping fists full of cash in the air while chanting “USA! USA!” we did well enough to warrant making plans to go back next year, armed with some valuable lessons that’ll hopefully lead to greater financial success. Sorry to sound so mercenary, but realistically, money is and always shall be a factor here. Stay for the whole show. Stay for the whole show. For the love of Cthulhu, STAY FOR THE WHOLE SHOW. Our area was supposed to have eight or so tables for other writers and small artisans. We had that many tables, but few of them remained full throughout the weekend. One artist stayed for two and a half hours on Friday and then left, never to return (bear in mind that Friday is NOT a great business day here, as the con is only open for a few hours in the evening and most folks use that time to check in, get a lay of the land, and scout out where the good parties are). Another showed up very late Saturday and didn’t bother to come back Sunday or Monday. People running a bake sale didn’t stick around for more than three hours either Saturday or Sunday, and never showed up Monday. Even those who did show up for all days tended to close up shop well before closing. I understand the frustration of sitting there, watching people go by, sometimes without ever even glancing at your table, but you can’t sell your stuff if you aren’t there to sell it. Justin and I both made sales within the last ten minutes of the last day, as did our author neighbor Calandra Usher (who, along with Jim McDonald, completed our happy little literary corner). Leaving early shows poor business sense. The artist/author alley area was, for reasons too complicated to go into here, moved out of the vendor area proper and into an escalator landing — which, to be fair, wasn’t an awful space. Anyone entering or leaving the vendor area had to use those escalators or the nearby elevator, so everyone saw us. However, we were back against the wall, which gave people more than enough space to skirt by us and never get within pitch range. And I admit this is probably a matter of personal perception, it often felt like the traffic was never as heavy as it was in the vendor area proper, where my wife was set up (Storied Threads, plug plug). Justin and I already spoke to the area manager, who was very receptive, so perhaps next year we’ll get a table in the vendor area proper. Once we caught someone’s eye, we had a precious second or two to draw them in. Justin was much better at this than I was because he’s more outgoing than I am, so I know I have to raise my game here. Once they got to the table, we had to pitch our books in a manner that enticed the potential customer into buying but wasn’t pushy. I hate hard sell tactics. They always turn me off, especially when there’s a whiff of guilt-tripping involved (“If you don’t buy my stuff, I can’t pay my mortgage!” — and yes, I have in fact heard that exact pitch before). We had our “elevator pitches” down pretty well, but they could use some improvement. I know mine could stand to be more informational and less generic. Justin gets interviewed for the TyroTV YouTube channel. 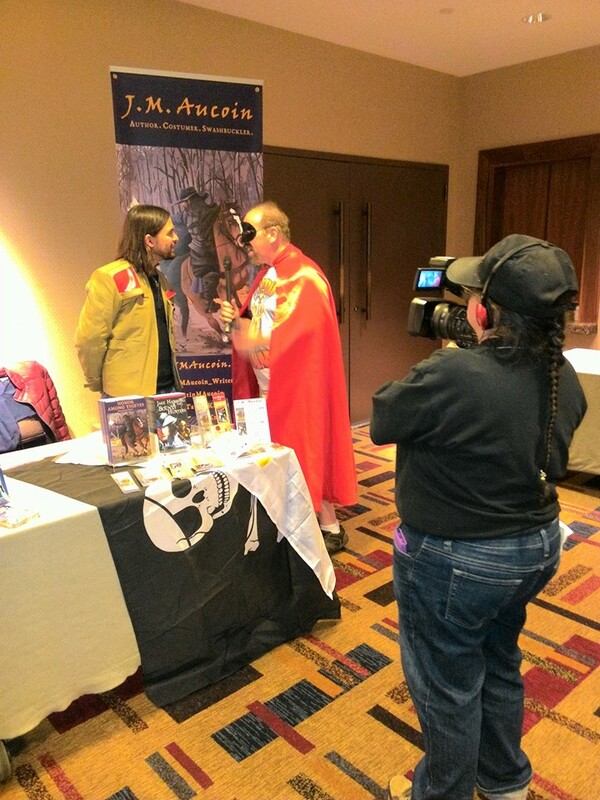 While I had no idea what to expect at the show, I definitely did not expect to be interviewed twice, or approached by someone in the early planning stages of a convention focusing on non-mainstream fiction, or meet a freelance editor looking to make connections within the indie author community. Thank god we had a ton of business cards to hand out. However, I can’t help but feel we missed out on some other networking opportunities, opportunities we initiated rather than received. Something to think about. One of our big hurdles was the fact we were selling print editions of our books, which cost more and our less likely to inspire impulse purchases…or so we thought. People were surprisingly willing to cough up $12 or so for a full-length novel, more so than they were to pay $5 for Justin’s Jake Hawking short story collection; he moved more copies of Honor Among Thieves than the Hawking omnibus. Nevertheless, I have a project in the works to create my own low-cost book to serve as an introduction to my two series, for the benefit of those who are intrigued enough to look into my work but might not feel like making a serious investment. I also plan to take a page from Calandra and Jim’s metaphorical books and look into selling e-book editions of my work directly at cons. The high point of the weekend came when a man came wandering toward our table, his eyes fixed on my display banner, and asked me, excitedly, “Are you Michael Bailey?” He was a fan of the Action Figures series — and, as it turns out, knew my cover artist Tricia back in high school. I’ve never been fanboyed over before. It was both extremely flattering and incredibly surreal. Justin and I got a hint of how powerful a social media presence can be. Perfect strangers recognized Justin from his Tumblr account, while my book covers got an ongoing response of, “Wow, those look really familiar!” In both cases, it helped attract people to our table who might otherwise keep on walking. Now we have to find ways to increase that recognition factor so we can parlay it into sales. The End (of the Wait) is Nigh! The idea of having to be outgoing scares me. Isn’t the reason that writers write so we don’t have to interact with people? Yeah, it’s outside my comfort zone too, but the experience has been a positive one so far, and as my friend Justin (J.M. Aucoin) says, I sold more books than if I’d stayed at home. Glad you both had a good time and want to come back next year! Space is the eternal problem – the hotel has made the main vendor room smaller twice in the past 2 years (for non-trivial reasons). Artists alley used to be in there, but had to move because of that. Just about every group (program, events, vending, larps) want bigger spaces. I definitely understand there were forces beyond the organizers’ control there. I’ve been on the organizational side of events myself and know well the special headache of a host venue throwing a totally unexpected and often unnecessary curve ball.